Go in search of Alaskan wildlife in Chilkoot Lake State Park on a 3-hour tour from Haines. With the help of your guide's expertise and spotting scope, you might see bald eagles, brown bears, harbor seals, and a profusion of wildflowers (seasonal). Includes lunch, and port pickup and drop-off. After morning pickup at the cruise port, your guide drives you through Chilkoot Lake State Park to several scenic locations. Look through the powerful spotting scope for the possibility of seeing wildlife such as bald eagles, harbor seals, and brown bears. Your guide explains how the animals fit into the Chikoot’s complex ecosystem and shares insights about their behavior. Depending on the time of year that you visit, you are more likely to see different animals. In May, June and July, eagles care for their young in the nest and wildflower blooms peak. 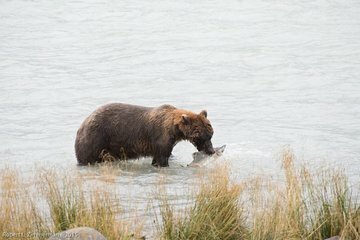 Migrating salmon arrive towards the end of July, filling the river and enticing brown bears to the water to feed. From early August through late September, bears are frequently spotted. The tour includes lunch and bottled water, and concludes at the end of three hours with return to your starting point.